The Osaka Municipal Government is today removing homeless communities from two of its parks in preparation for the World Rose Convention. Around a third of Japan's 25000 homeless are based in Osaka, and these evictions are meeting mass resistance. "We cannot tolerate such violent acts," about 100 people - some 17 homeless people and their supporters - shouted as the city government started dismantling the tents in Utsubo Park at around 8 a.m. Two people from the homeless side sustained injuries in a struggle with the officials at Utsubo Park, where tents were quickly removed according to the BBC. In Osakajo Park, the tents where some five homeless people lived were barricaded. 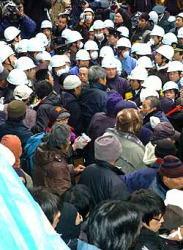 Supporters held on the barricade to resist the removal, resulting in a standoff lasting for several hours. More than 750 city employees and 350 police have been drafted in to remove the tents. The Osaka Bar Association has ruled that the evictions will be illegal if the authorities do not adequately rehouse people, so far they have only recommended they stay in shelters, with poor privacy. A homeless man in an Osaka park not currently facing evictions recently registered his tent as an official address, although authorities claim this is not relevant and refused to accept documents for similar applications from the affected parks. Many homeless people in Japan live in stable tent communities in the parks of its larger cities. In Tokyo, tent villages in Ueno park have an agreement with the authorities that they will temporarily pack up and 'hide' for major events. However, Japan has increasingly been attempting to remove its homeless park communities from view permanently. libcom.org received an appeal on our forums. There was a co-ordinated eviction against many of the autonomous spaces organised by the homeless in the parks of Osaka today, the 30th of January. The parks are the refuge of people displaced by the brutal economy of Japan. The homeless recieve no help from government or political parties, and are not eligible for social welfare. The winter here is incredibly severe, and the tent cities and soup kitchens that the homeless themselves organise have been attacked by the city authorities. As we recieve reports of the assault on these dispossessed people we shall update you on the situation. There have been a number of arrests, and as far as we know, some comrades are looking at long jail time for taking part in the resistance. Also, on the 28th January there was a street demonstration in Osaka that developed into an intervention into the City Hall of Osaka, there was a brief skirmish inside the City Hall lobby with officials and police. The homeless struggle in Osaka is under severe attack and surveillance by many police and their intelligence service friends. The street demonstration was very heavily contained by many police, but still we resist. So, many homeless people inspired by this judicial precendent attempted to register their unusual living situations, to prevent the victimisation and harrassment from city officals. The legal situation is ongoing, as Osaka City Council attempts to overturn this ruling, as it would mean that homeless people would be eligible for social support and welfare. We understand the limitations of fighting our struggle so that we the dispossessed can fit into the brutal economic system. We want our whole lives as ours, not workfare, not welfare - We want a entire change from this capitalist system.